They level the playing field so one pilot doesn’t have an advantage over another by using more powerful equipment. This allows the pilot’s skill to win the race, not their equipment. Aircraft builds can be planned with confidence that they will be accepted into competition. To ensure radio equipment is compatible with fellow pilot’s equipment as to not cause interference. These are only guidelines or suggestions for chapters to get started. These are not compulsory. The Tiny Whoop class produces an aircraft that is safe, fun, affordable and approachable to all skill levels. These aircraft are very small and light resulting in little to no property damage when crashed. Therefore they can be flown in venues larger racing drones could not, allowing a truly unique and fun filled racing experience for both pilots and spectators alike. The Micro Class produces a small yet quick and capable aircraft. They are also very quiet and can be flown indoors or outdoors around small obstacles, making them perfect for backyard competition or practice for your larger racing drones. 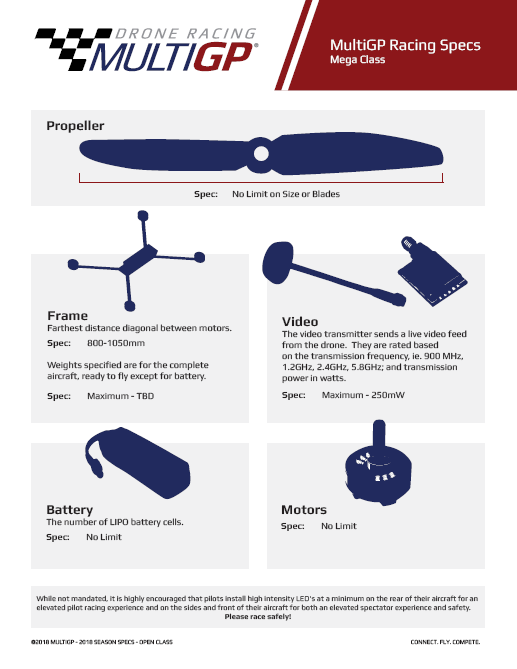 In terms of safety, these aircraft present slightly more risk due to their speed and exposed propellers. Therefore it is advised that more precautions are taken such as clearly marked flight lines. The 3S Class produces a multirotor well suited for beginners and professionals alike. Pilots are able to control their aircraft without fear of their equipment over-powering their flight skills. The Mega Class is targeted at giant size drones that are larger than 800mm. This class is designed to provide a guidelines for those seeking to race large scale drones. * While not mandated, it is highly encouraged that pilots install high intensity LED’s at a minimum on the rear of their aircraft for an elevated pilot racing experiences and on the sides and front of their aircraft for both an elevated spectator experience and safety. Classes are determined based upon the lipo battery cell used to power the aircraft. Remember, classes are guidelines to provide competitive standards within a typical MultiGP race day. Chapters can choose to define and run their own classes if they wish by definining them during event planning. Many pilots will ask why the power limit of the Video Transmitter (VTx) is limited to 250mW. This is to increase the success rate of multiple pilots having perfectly clear video transmission. If some pilots are transmitting at a higher power, the chance of experiencing frequency issues increases. As new technology is released, classes and specs will be updated to either incorporate or withhold the advancements to maintain fair competition as the number one priority. All aircraft must be built with the ability to easily change vTx channels in a timely and accurate manner.